Rome is one of the world's great cities. You can't see everything that is worth seeing in a day or even in several days. 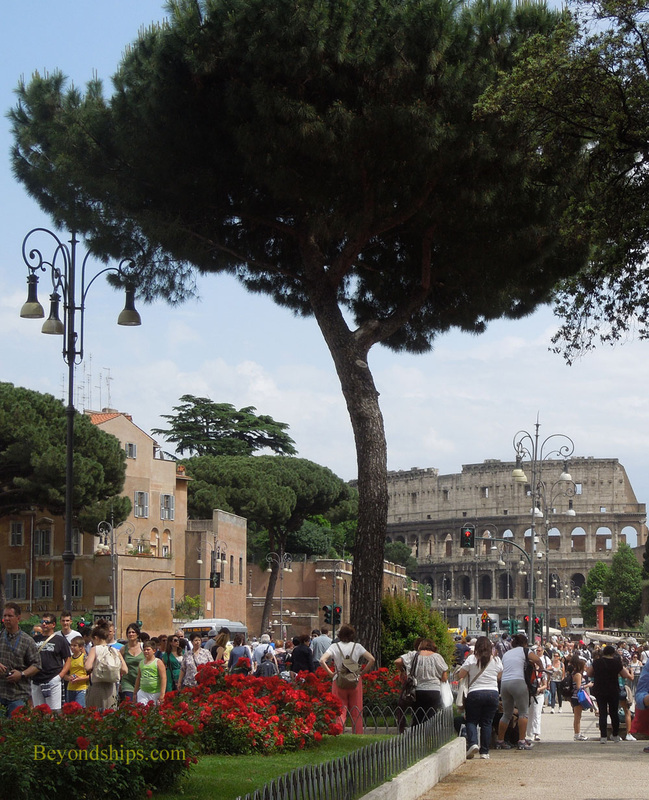 However, it is a very walk-able city and you can see quite a lot in one day just walking through central Rome. Of course, you must be careful of the busy Roman traffic and expect delays due to the throngs of tourists at the major attractions. 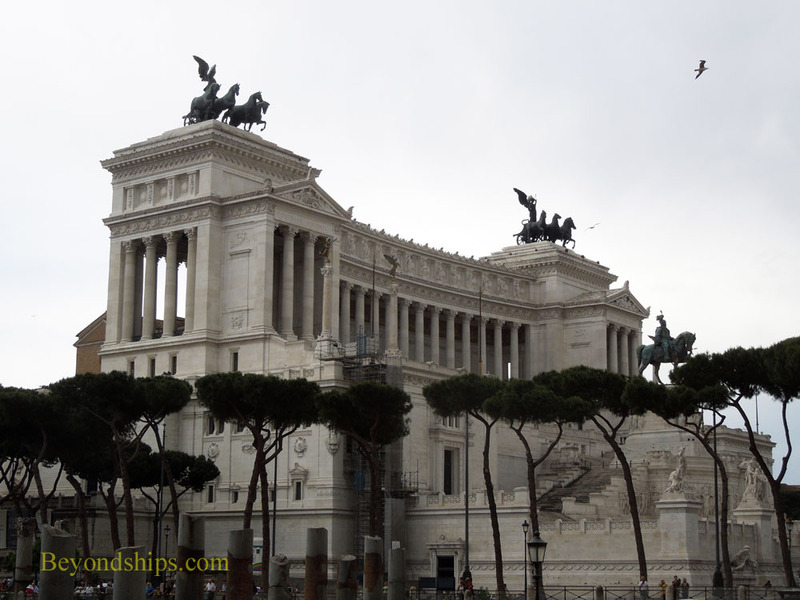 This article is based upon a walk that I took through central Rome. 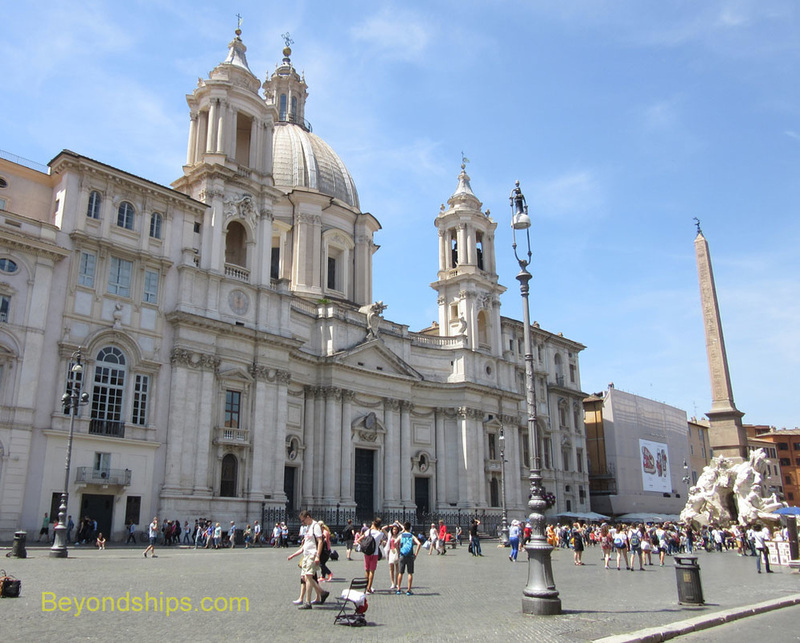 The starting point was the Piazza Navona and the destination was the Colosseum. I did not take a direct route but rather weaved my way from one landmark to another. It took about two hours but if you decide to spend time at the various landmarks or stop off to have something to eat at one of the outdoor cafes, it will, of course, take longer. 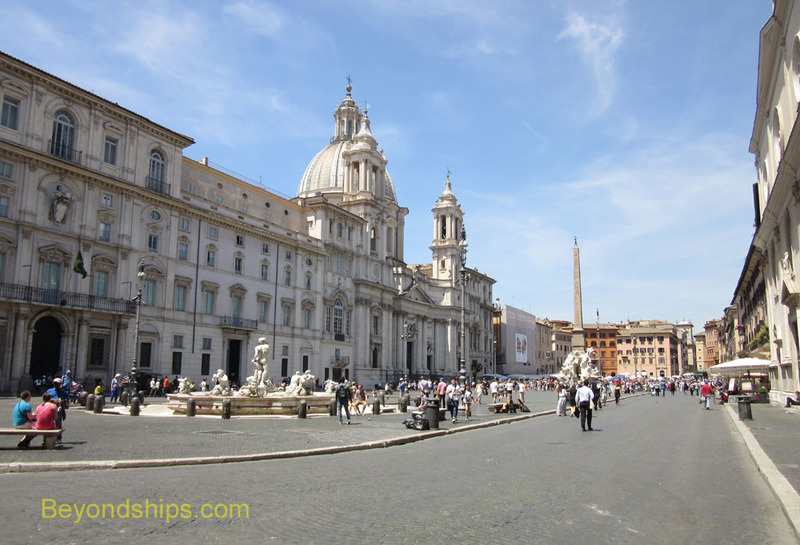 The Piazza Navona is a large, beautiful plaza built on the site of the ancient Stadium of Domitian. Indeed, you can tour the area under the piazza and see some of the remains of the stadium. At the center of the piazza, is the Fountain of the Four Rivers, a 17th century monument by the sculptor Bernini. It sits in front of the Chuch of Saint Agnese in Agose, which was designed by Bernini's rival Borromini. Urban legend has it that the scowls on the faces of some of the statues in the fountain reflect Bernini's opinion of the church design. However, the fountain was completed before work on the church started. Also in the square are the Fountain of Neptune and the Fountain of the Moor, both by della Porta. The Piazza Navona is more than a place of great art and architecture. There is always something going on and it is a great place to people watch. To facilitate this, there are outdoor cafes and restaurants. (See separate article). 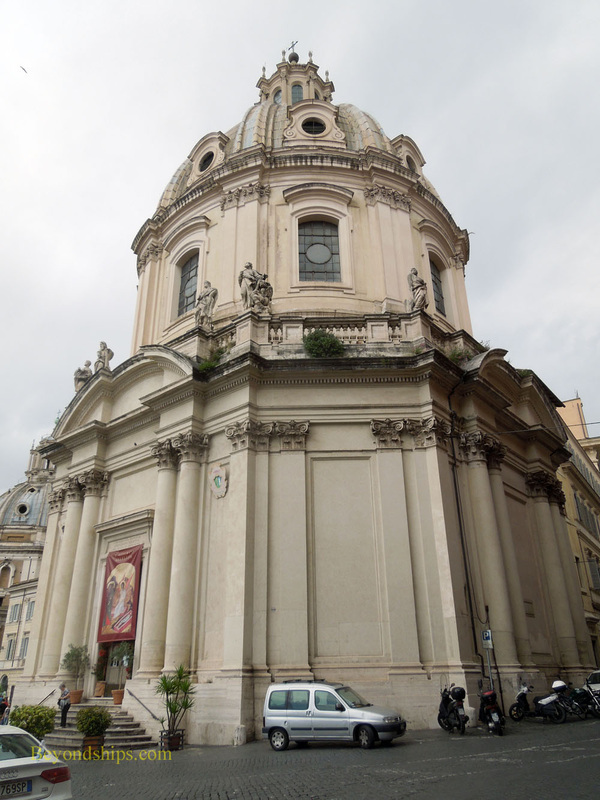 Heading in an easterly direction, I proceeded through the winding streets to the Pantheon in the Piazza della Rotundo. 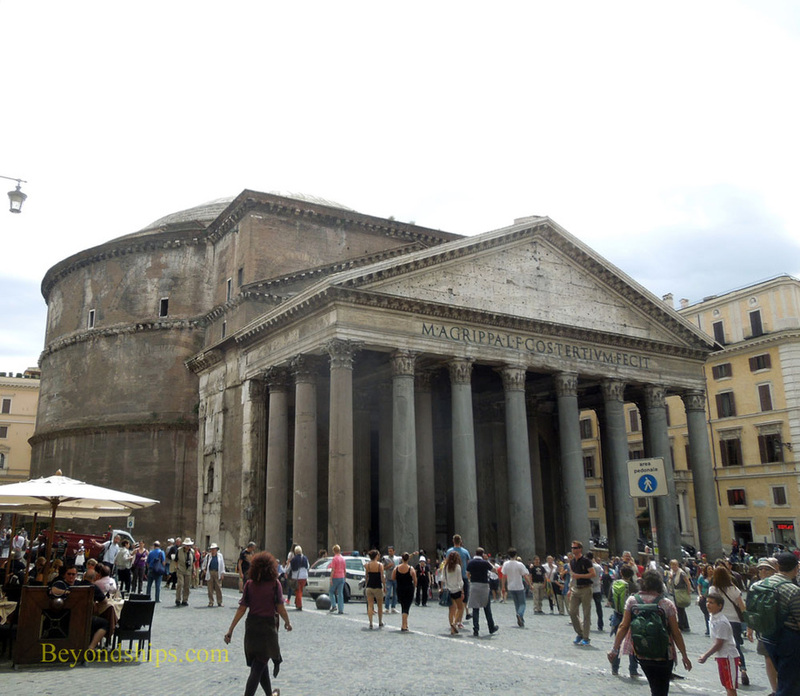 Built in 125 A.D. as a temple to all the gods, the Pantheon became a church in 609 A.D. It is one of the best preserved ancient structures. Architecturally, it is a very important building. The dome was the largest in the world for over 1,000 years. It is also very elegantly proportioned. It is the burial place of the artist Raphael. A top landmark, there are always people touring the Pantheon or enjoying the cafes in the piazza. My next goal was the Trevi Fountain. Going in a generally northeasterly direction I passed through the Piazza di Pietra. 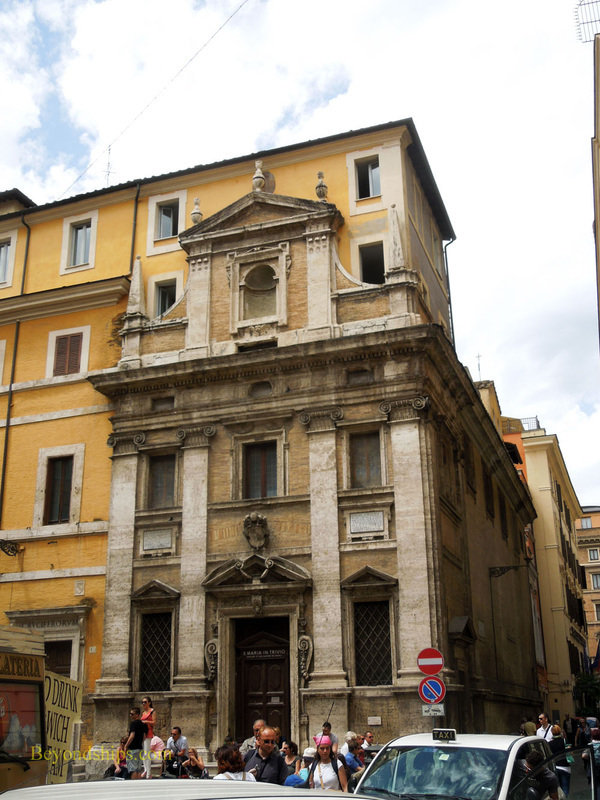 Here is a curious building that houses Rome's stock exchange. 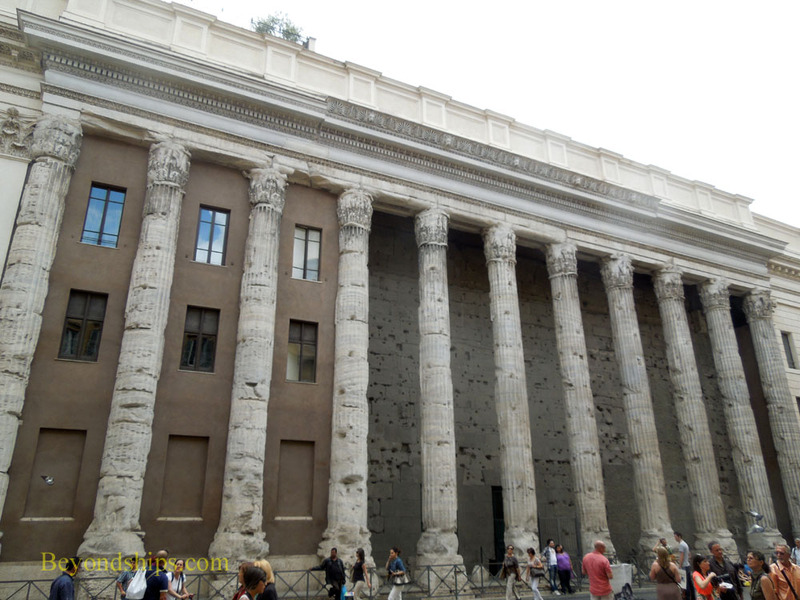 On one side of the building are eleven columns that are all that remain of the ancient Temple of Hadrian (145 A.D.). In the 17th century, Pope Innocent XII commissioned a new building for this site and the architects incorporated the remains of the old temple into the new building. 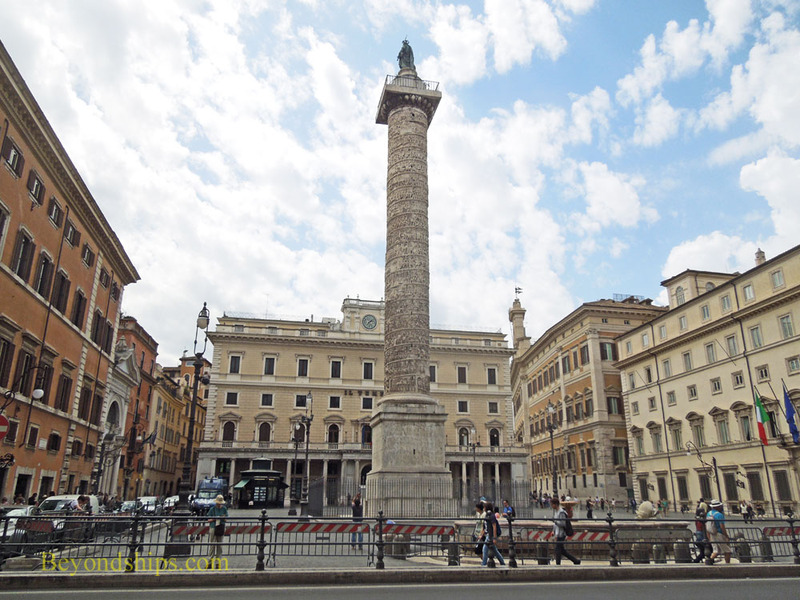 In the Piazza Colonna, I found the Column of Marcus Aurelius (Aurelian Column), which commemorates the Emperor Marcus Aurelius' victories over the German tribes (above). The statue on top is not the Emperor but rather a statue of St. Paul added in 1589. Going north through the Piazza dei Crociferi, I passed the 16th century Santa Maria in Trivio (right), one of the small churches that give character to the fabric of the city. 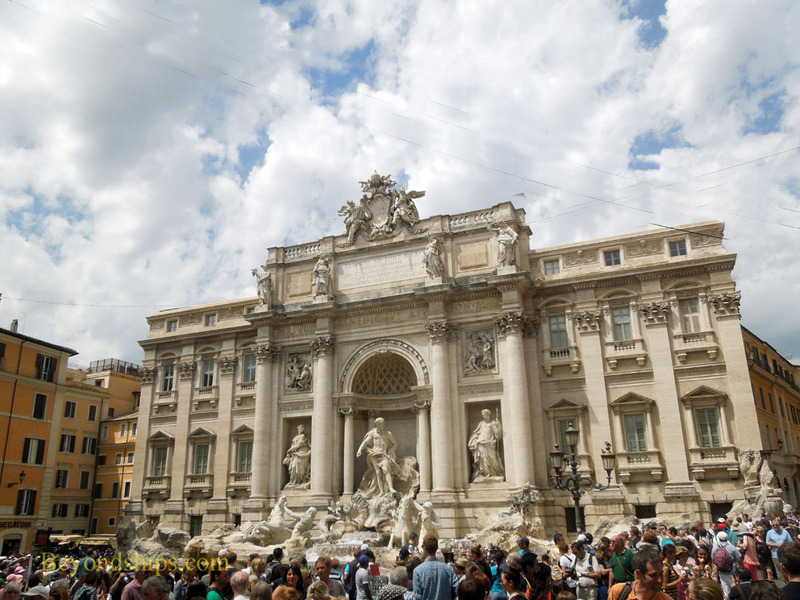 The Trevi Fountain has been called the world's most beautiful fountain. Built in a small square, the fountain is backed by the Poli Palace. It lies at the end of an ancient aquaduct that transported water to the city from 20 km away. The current fountain was completed in 1762. It is largely the work of Nicola Salvi although at one time Bernini worked on the project. The church in the square is the church of Saints Vincent and Anasius complted in 1650 (above left). According to legend, if you toss a coin into the fountain, you will return someday to Rome. Because this is one of Rome's must-see landmarks, there is usually a large crowd here. From the Trevi Fountain, I turned south along a street that began as the Via dei Lucchesi, then became the Via della Pilotta and then the Via IV Novembre. Along this part of the journey, there was not too much of interest. 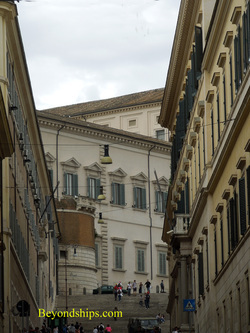 I had a glimpse of the Quirinal Palace, the official residence of the President of Italy (above left). 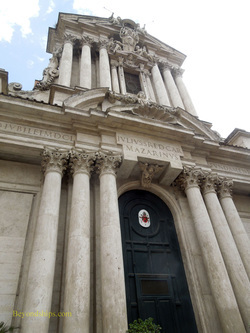 At the end of Via IV Novembre, I turned right until I came to the Santissmo Nome di Maria al Foro Triano. This charming Baroque church was built in 1663. It sits on the boundary between modern Rome and the ancient world. Before entering ancient Rome, there are two more recent landmarks worthy of note. Off to the right of the Santissimo Naome di Maria is the Piazza Venezia dominated by the 20th century Vittoriano, dedicated to the first king of unified Italy, Victor Emmanuel II (above left). Also in this busy area is the Palazzo Venezia, completed in 1464. At one time it was the embassy of the Venetian Republic. 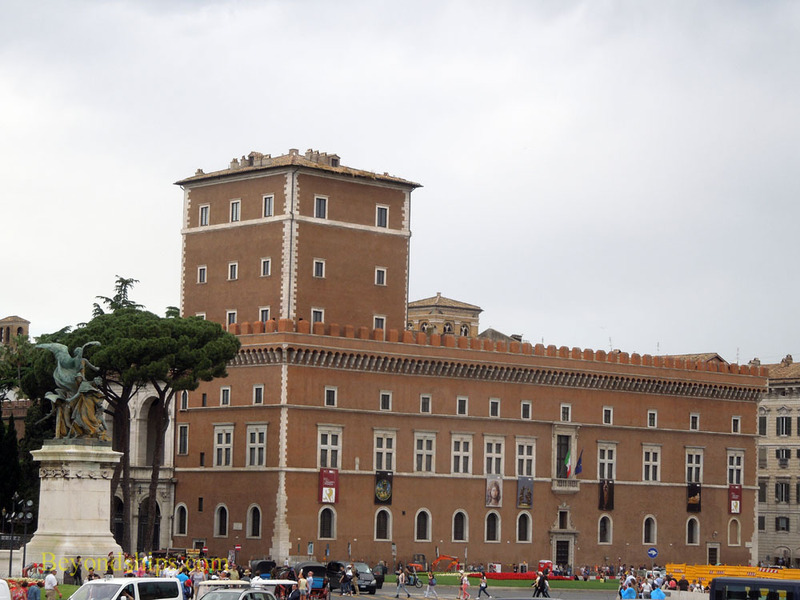 More recently, it was used as the headquarters of the fascist dictator Benito Mussolini who used to give speeches from the balcony.